One financial New Year’s resolution is to read and watch less financial news. O’Byrne stays up to date with financial markets, including breaking financial news, because he writes market updates and provides comments to media. However, in the age of Trump and Brexit, it can be hard to keep up with it all. Unsubscribing from alerts and becoming more selective and focused in news consumption can filter out much of the daily/weekly market noise and help you get more valuable long-term signals. O’Byrne believes that diversification and owning gold as a hedge and safe-haven asset will be important in 2019, because we live in an increasingly polarised and uncertain world that casts a shadow over our economies and the investment outlook. This is clearly seen with Brexit, the risk of ‘Italexit,’ an increasingly fractured EU and Trump’s aggressive foreign and economic policies, including trade wars. 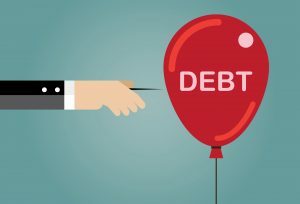 There are also risks posed by the global debt bubble as the world nears $250 trillion in debt, and the global debt-to-GDP ratio has risen to nearly 320%. O’Byrne believes that diversification and owning gold as a hedge and safe-haven asset will be important both in 2019 and in the years ahead.